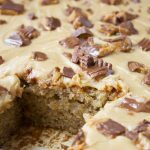 To make this delicious cake, just toss everything into a food processor, then pour into two pans and bake. Finally, sandwich together with a delicious 2-ingredient lemon mascarpone cream. It’s cake perfection! I’m pretty sure I’ve mentioned here before that I’m a bit of a layer cake snob. I really don’t mind if it doesn’t look perfect (rustic rules), but I want it to taste as good as it sounds. And sadly I’ve tried many many cakes that just don’t make the cut. Which is why I only post cakes here that I love; that are really easy to make; that I’ll make time and time again. 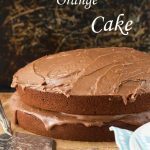 Like this really good, really simple chocolate orange cake which is one of the most popular recipes on the blog. 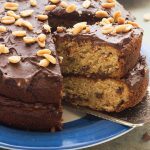 Or this peanut butter, banana and chocolate chip cake which hits the spot every time. Because peanut butter and chocolate…. mmmm! So you guessed it, I really really like and recommend this food processor lemon mascarpone cake. Mr. Scrummy often complains that I only make chocolate cakes, and until now I couldn’t really deny this (oops). But now I can honestly say that there’s another kind of cake on the blog that’s just as scrummy. I might just choose a piece of this cake over a piece of chocolate cake, which means it must be good! I get recipe inspiration from many places, but it’s especially nice when it comes from friends or family. Mr. Scrummy and I had lunch with my friend Melinda recently. It’s always wonderful to see Mel, but especially when she comes with a homemade cake as delicious as this! We all made short work of a big piece, then the naughty girl left the rest of the cake with us and we scoffed the whole lot over the next few nights. I really looked forward to that nightly piece of cake, and some days I even had two pieces [blush]. No surprises then that I asked Mel for the recipe. 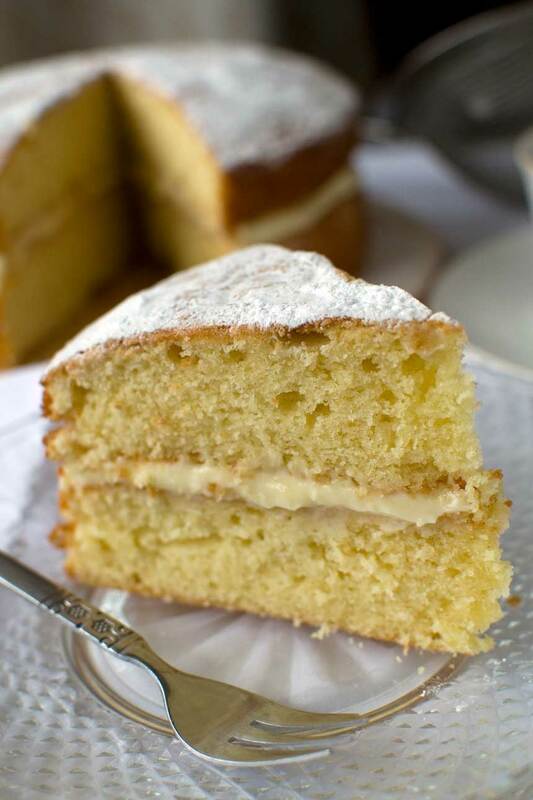 Essentially this is Nigella Lawson’s basic vanilla cake (otherwise known as Victoria Sponge) sandwiched together with a mascarpone and lemon curd cream. Just those two delicious ingredients. How easy is that? This is also a one-bowl cake with one cup each of sugar, butter and flour in it, so it’s insanely simple to make. You just whizz everything up in a food processor. Seriously, that’s it. I bet you could remember the recipe after making it a couple of times. The resulting cake is light, buttery, and moist. Delicious. The cake is light, airy and moist. I made it a second time soon after this, and added more cream. Even more perfect! If you don’t have a food processor, no problem – just cream the butter and sugar together with a hand held whisk or stand mixer first, then add the other ingredients, but skip the baking powder. In fact this is how I made it as I’ve already packed my food processor off to Australia – as you do. If you wanted to you could make this very simple (but no less delicious for it) cake a bit fancier by topping it with strawberries, or even adding blueberries into the batter. In fact Mel actually sent me a blueberry and passion fruit version of this cake. I haven’t tried it yet but I can’t wait to. Instructions in recipe notes! A delicious vanilla cake that couldn't be easier to make. 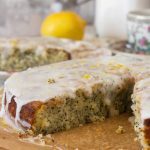 Mix the ingredients up in a food processor, then bake and sandwich together with a 2-ingredient mascarpone lemon cream. Preheat oven to 355F / 180C. Line (with baking paper) and butter two 7” sandwich cake pans. Process the soft butter and sugar together in the food processor for a few seconds, then add the vanilla, eggs, flour and baking powder and process until just combined and smooth (be careful not to over mix or your cake may end up too heavy). Pulse in the milk gradually until the mixture is a soft dropping consistency. Pour the batter equally into the pans and bake for about 25 mins, until a metal skewer or knife comes out clean. Cool the cakes for 10 minutes in the pans, then turn out onto a wire rack and cool completely. Meanwhile, make the lemon mascarpone cream. 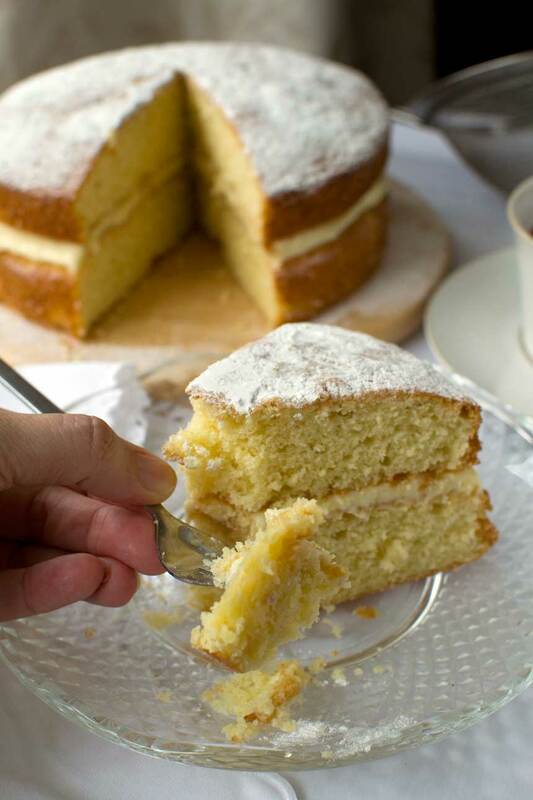 Simply whisk the lemon curd into the mascarpone cheese, then spread thickly to sandwich the cakes together. Just before serving, dust with icing / confectioner's sugar. Only slightly adapted from Nigella Lawson's recipe for Victoria Sponge. Lemon mascarpone cream also adapted from an idea from Nigella! *This is how much lemon curd I added to the mascarpone, but taste and add more if you like! If you don't have a food processor, no problem! Just cream the butter with the sugar with a stand mixer or hand held mixer, then slowly add the other ingredients. I've made this cake several times both in the food processor and with a stand mixer. The food processor method is faster (BUT this is debatable, depending on how easy your food processor is to clean!). A couple of times though I over mixed the batter in the processor, which led to a slightly heavier cake. Just make sure you use soft butter so that everything combines easily and quickly in the processor. To be super safe you could even combine the sugar and butter for a few seconds first before adding the rest of the ingredients as described in the recipe. Above all only process until everything is nicely combined and smooth. Please let me know which method you followed and how your cake turned out! If you like you can make a delicious blueberry and passion fruit version of this cake. Simply add approximately 100 grams / 3.5 ounces blueberries to the batter before baking. Sandwich with whipped cream, then make a passion fruit icing for the top. Scrape out the contents of 2 passion fruit and sieve to get the juice (if you put the flesh, seeds and juice in a blender first and give it a quick whizz before sieving then you release more juice). Mix with 100 grams / 3.5 ounces icing sugar, then drizzle or spread the thick icing over the top of the cake. This looks super yummy Helen! Hope your move to Oz goes really well! Wow!! Helen! I love this easy recipe!! Can not be easier than this! This cake looks gorgeous Helen! So easy to make, too! 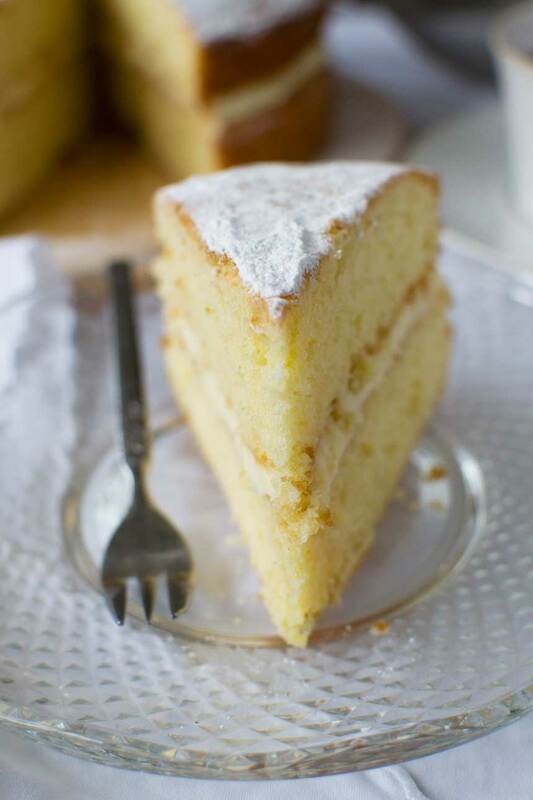 I’m with you, I don’t care how the cake looks, it needs to taste delicious and preferably be made from scratch 🙂 Can’t wait to try this, love mascarpone and the combination with lemon curd is so delicious! Thank you so much Mira. I pat myself on the back when I make a cake I really like. Of course, NOWHERE NEAR as beautiful as the cakes you make! 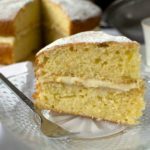 There’s nothing better to me than a lovely lemon cake and I love the idea of making it in the food processor, must try this. I’m a cake snob…if I’m inhaling all those calories it’s gotta be worth it. 🙂 I normally go for chocolate but citrus desserts are right behind it! This looks so light and I love that you can make it in the food processor! The mascarpone is such a lovely touch and I can tell every calorie of this would worth it! I’m now rather desperate to make this cake Helen! It looks so light and fluffy! 😀 I’ll let you know how I go! Please do, Lorraine! It’s really just a simple Victoria Sponge recipe with the filling added, but somehow it tastes amazing! You should be a layer cake snob – you’ve mastered it! It’s funny that you said you’d choose this over chocolate cake. 100% me too! My favorite cake in the world is vanilla cake with vanilla frosting, lol! But I love the addition of lemon here and you can never go wrong with mascarpone. Hey, Helen! This is an amazing recipe, thank you so much for it. Each bite equal a happier tummy. Hi Isa. I agree! I love this cake! Hi, I just finished making this cake and I was wondering the best way to store it after letting it cool down . I already put the mascarpone filling so can it be stored in the refrigerator for 1 day? Thanks! Hello Oscar! It will be absolutely fine in the fridge for a day. I’d just recommend taking it out of the fridge an hour or so before you want to eat it so that it comes back to room temperature. I’m guessing you’ve already found out this for yourself by now though. Hope you enjoyed it! Well, ssshhhh, I’m in a competition and plan to use this recipe! Fingers crossed it works really well and I win. Pray for me. Loving this blog by the way.